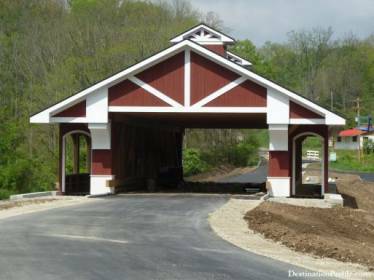 Preble County’s newest covered bridge was opened on Memorial Day, 2012. 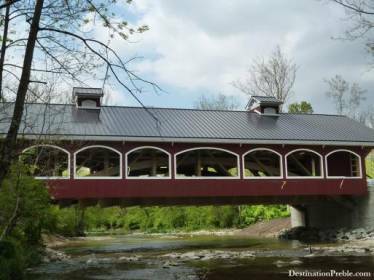 The bridge is a single span modified burr arch design, covered timber structure with concrete foundations that spans 108 feet. A six-foot walkway is located on each side of the bridge to provide for pedestrian traffic. This bridge replaces the old steel truss bridge which was constructed in 1929. Portland Bolt was chosen to manufacture and supply 14,400 pounds of domestic, galvanized hex bolts, lag screws, timber bolts, drive spikes and 34’ long high-strength rods because of Portland Bolt’s in-house manufacturing capabilities. 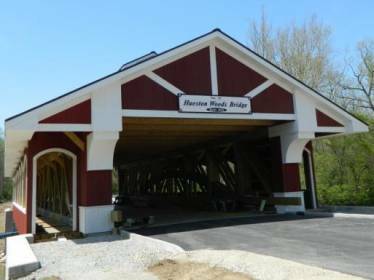 This was another successful covered wooden bridge project that was added to Portland Bolt’s long list of wood bridges.